How often do you need to check your uninterruptible power supply if you have installed one of the latest high-efficiency smart and intelligent UPS systems? Whenever we turn to discussions on UPS maintenance when discussing a new Eco Power Project with a client, this is always a hotly debated topic. One of the reasons behind this is that we have become accustomed to rapid changes in the various ‘maintained’ systems we use everyday. Your car is a classic example. Twenty years ago you were told that an oil change was required every 5-6,000 miles with a major service every 10-12,000 miles. With a new vehicle there was often a ‘run-in’ period up to the first 500 miles when your car was then checked and the oil possibly changed. Today’s motor vehicles are far more intelligent, efficient (with eco-modes) and as a result service intervals have been extended with often the car notifying a service centre that will call you when the vehicle requires service. Traditionally we used to treat uninterruptible power supplies the same way and to a degree we still do today. With a car or any motor like a standby generator, it’s the consumables that we need to ensure are changed on a regular basis. In a UPS the primary consumable is of course the battery set and how often this needs replacing depends on a number of factors including battery design life, room ambient temperature and number of charge/discharge cycles. The main UPS battery technology is sealed Valve Regulated Lead Acid and these typically have a five year design life or a 10 year design life with replacement generally considered around years 3-4 and 7-8 respectively. Room ambient temperature is a big consideration in battery working life. The ideal is 20-25degrees Centigrade. Battery manufacturers generally provide a rule of thumb that for every 10degrees rise above 20, the battery life halves. If you have a ten year design life battery in a room at 40degrees Centrigrade you can expect this to fail within 2.5 years. The number of times a battery is cycled is also important. In a UPS the batteries are in a standby mode most of the time and discharges are generally short-duration and few and far between. Often you will see a power blip or series of power cuts followed by long periods of stability. As most VRLA batteries have a 300-400 cycle range then you can expect that it will generally be their age that will lead to them losing capacity in the long term. The only consumables in a UPS system are the capacitors and fans but these generally only require replacement from around year 8 of operation and only then as part of a general refurbishment. Most companies view uninterruptible power supplies as critical pieces of infrastructure with a working life of 10 years and so may look to replace rather than refurbish them. So coming back to how often should you check your UPS under a preventative maintenance plan? The UPS will check its batteries using an automated test and often this will take place very 24hours. This will alert you to any potential problems. However this will miss any visual observations that could be made which will highlight potential problems such as a white powder residue around terminal connections or even the plastic case of a battery buckling. Both a potentially signs of heat damaged caused from a rising internal impedance and indicate a need for battery replacement. At EcoPowerSupplies we therefore recommend an annual preventative maintenance visit (PMV) and inspection. Some clients do specify two visits per year but this is generally less needed with a modern UPS system and may be more inline with onsite maintenance regimes of other plant and equipment. An annual preventative maintenance visit is recommended even from year 1 of installation. The reason for this is that it is very useful to have an audit trail of readings and notes from initial electrical connection of the UPS system and its commissioning to each subsequent preventative maintenance visit. Even if the warranty provided by the UPS manufacturer is extensive (3-5 years) we would always recommend an annual maintenance visit. The primary reason for an annual preventative maintenance visit is that your uninterruptible power supply is part of the critical power infrastructure. 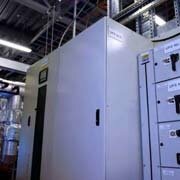 It is there to keep critical IT and associated systems running during a mains power problem or power cut. Annual maintenance inspections ensure its smooth running and prevent potential problems from causing downtime. At EcoPowerSupplies we use UPS manufacturer certified engineers to guarantee the health of your UPS system. Our engineers are factory trained and have access to the latest firmware, technical bulletins, software updates, engineering bulletins and as important manufacturer-certified spares and assembly replacements. Our engineering network often works in tandem with UPS manufacturer’s engineers for whom we also provide additional service works as required including full load bank testing, comprehensive test reports, electrical works inspections and thermal imaging. Logs: check operational history and alarm logs. General: inspect and clean the UPS system, batteries and accessories. Cooling: check fans for operation and ageing. Connections: check and adjust all electrical connections (AC and DC). Functional: check all functions operate correctly. Firmware: check firmware version and upgrade if required. Operation: check the transfer from inverter to static bypass and back. Mains failure: simulate operation with or without load bank. At EcoPowerSupplies we provide a range of UPS maintenance contracts with different response times and features. We can also customise these to suit a specific client site and Service Level Agreement (SLA). The main difference between our UPS contracts is the response time and what is covered within it. Our UPS maintenance contracts are comprehensive. Here is a typical Platinum 4 Clock Hour Cover contract. This contact may be adapted to suit a specific client or site specific service level agreement. The shortest duration response time we have provided for a client is 2 clock hour response. UPS remote monitoring is a growing feature within our maintenance contracts. For some clients the UPS use SNMP and communicate with our service term via the local network. We can also provide GSM enabled modems to keep the communications side free of the local datacentre network when required. Remote monitoring and automated alerts provides our UPS service engineers with immediate problem notifications. We always recommend that hardwired UPS systems are installed with an external maintenance bypass. The reason for this is that during service work, the bypass allows us to fully isolate and test the UPS without interruption to the connection loads. Having an external bypass switch installed also means that the preventative maintenance visit can take place during normal hours rather than outside hours which will have a price premium. At EcoPowerSupplies we can also provide generator maintenance contracts. With generators it is more common to have either one or two annual preventative maintenance inspections per annum with on-site monthly testing. This ensures that the standby generator is always ready for start-up to support the UPS system and any other connected essential loads. For more information on our UPS or generator maintenance contracts please contact the Eco Power Projects team on 0800 612 7388. We cover a wide variety of UPS manufacturers and brands and provide additional battery testing and support services.